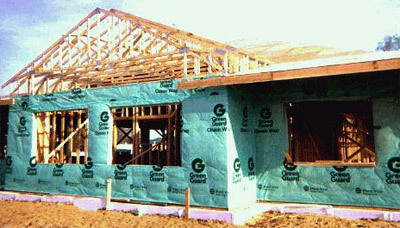 Wisconsin Truss, Inc. is a truss company that was started in 1972. It started by manufacturing roof trusses and added floor trusses to the production line a few years later. As customer demands and needs grew, other specialty products were added. The company was started with one designer and now has a staff of seven full-time designers. 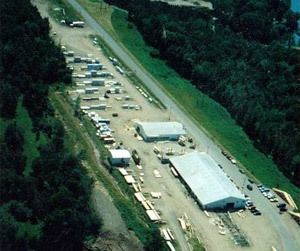 The primary goal at Wisconsin Truss has been to produce a quality product combined with a reputation for excellent customer service. We currently service customers in Wisconsin and Minnesota. A floor or roof system is only as good as it's design. Using the most updated, advanced Robbins Engineering software available, our truss designers will engineer your roof trusses to meet the exact specifications of your roof system. Our designers are able to design roof systems for residential, commercial and agricultural buildings. Actual shape of roof truss varies with each application. Before today's advancments in truss design, most trusses were triangular in shape. Multiple configurations are now available to enable the consumer to incorporate variations in roof and ceiling design. Proper on site assembly of the roof system is assured by detailed layout sheets generated by our designers. Web trusses provide space for installation of plumbing, electrical and HVAC duct systems so contractors do not have to cut into structural support joists which weakens a critical part of the structural integrity. Floors are more level and this truss system has been proven to limit annoying floor squeaks that occur over the years. Floor trusses allow for longer, clear spans eliminating the need for support beams in many cases. Web truss systems allow for ready-to-finish ceilings because everything is in the floor space. One advantage of floor trusses is design flexibility. Special engineering features allow for various bearing conditions, cantiliver sections and floor truss heights can be varied allowing for a variety of elevations in floor plans. With a floor truss system designed and built by Wisconsin Truss Inc, you can eliminate unsightly beams and columns by utilizing clear spans not available with dimensional materials. 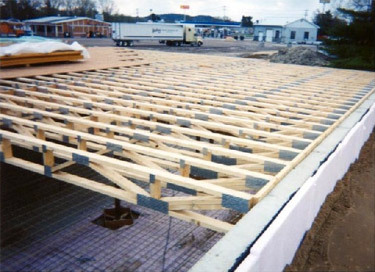 Floor trusses are custom manufactured to your exact lengths and are delivered in bundles clearly coded for rapid placement.